True confession, and I think we better get it said and out of the way. I would hate for you to hear it from someone else, after all this time we’ve spent together. So,…. …it’s true what they say – I truly am one – a cry baby. I cry when I’m happy, I cry when I’m sad, I cry when I’m angry and I cry when I’m broke :-). I cry when I feel hard done by, when I think someone’s being unfair like a few weeks ago, I cried when I got a parking ticket in a car park, just because some stallholders ‘lied’ that I drove through orange cones and the police believed them over me. With my huge car (3 car seats needed), I pointed out various inconsistencies to the policeman but it was too late, I’d been yellow-slipped. I was mad and rather than explode, silent, still angry waters flowed! This evening we went to see the new ‘Karate Kid’ with Jaden Smith, son of Will and Jada Smith. OMW (Oh my word), I was BLOWN away. Within the opening minutes of the film, someone tickled the bladder near my eyes and it burst loose, soaking my eyes and creating tiny rivulets running down slightly raised cheeks. I won’t spoil it but watching a scene about ‘moving’ created such hope and despair for me. I remember leaving Nigeria only a few short years ago, the fears, the wishes, the desires and boy, oh boy the realities of living in a different culture – growing to know it, learn it and live it. Within minutes, I was in laughter – you can imagine that a movie that has in it the DNA of ‘funny’ Will Smith and Jackie Chan! For the two hours plus we sat fixated to the big screen, I vacillated between laughter and tears: the experiences in motherhood, trials children face in school (and one of my daughters was bullied for a brief period), the joys of discovery and the bittersweet, spicy flavours of life. Oh people, that’s life aye? 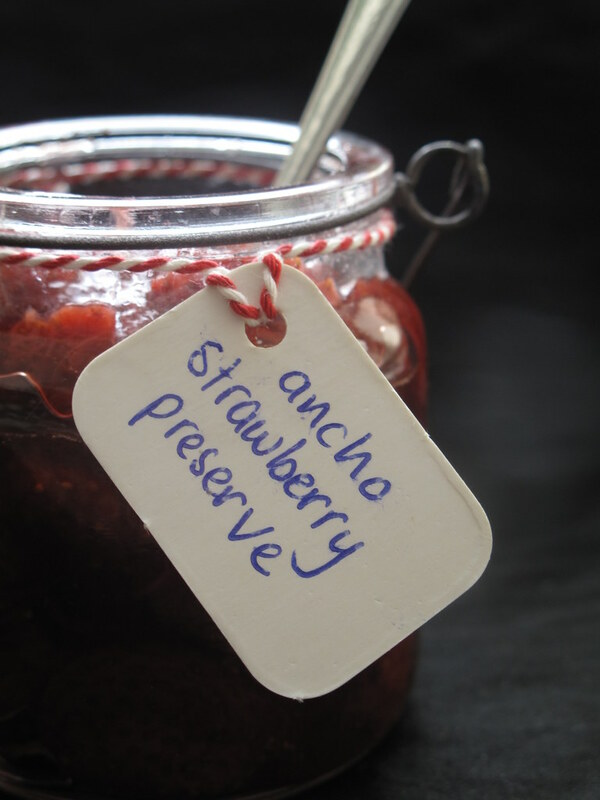 Take this ancho strawberry preserve for instance, it is a delightful recipe that may keep your eyes moistened, depending on how many chillies you use. 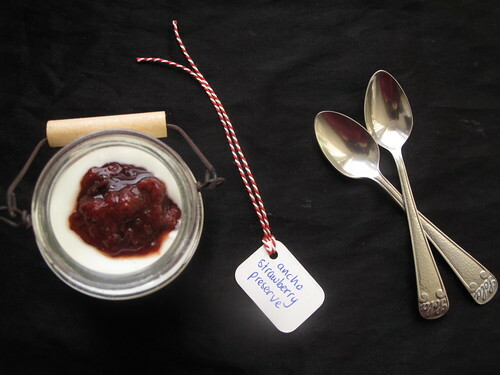 It will bring bursts of laughter too, or moans of pleasure swirled through some Turkish yogurt, especially if like me, you’re a sucker for yogurt and jam and imagine it as a trio of elements in a Bruléed French toast (recipe will be shared later on this week). It has all the elements – mystique, intrigue, excitement, good looks and more. 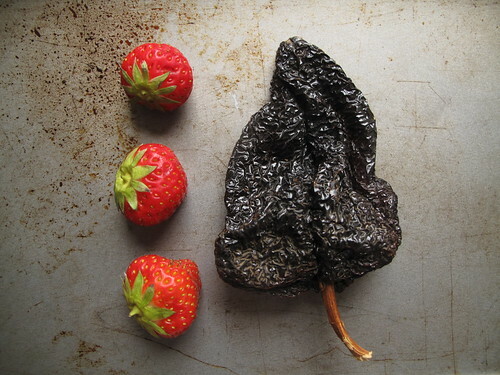 But I can’t take any credit, I was inspired by a recipe by Amanda Hesser on food52 titled Preserved Strawberries with Chiles. Oh and before I forget, yes, we’re still eating healthily, even as we end week 4! 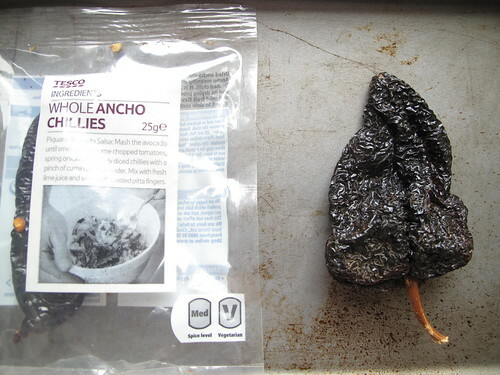 My adaptation of Amanda’s recipe follows but first, things you should know – I’ve swapped maple syrup for the sugar, lime juice for lemon, added some vanilla extract and used (part of ) an ancho chilli instead of a New Mexico chilli. 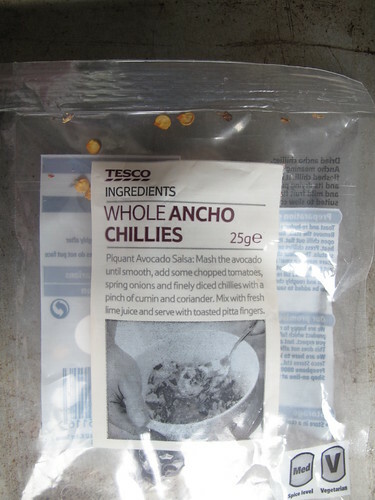 I recommend this recipe if you want to taste a bit of ‘when summer met Mexico’. 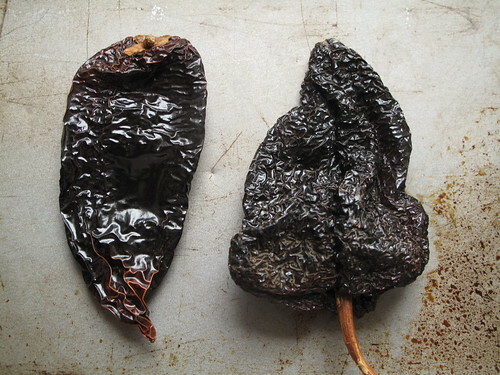 If you want to experience the pungent fragrance of ancho chillies, choose a cool summer’s night where a stillness in the air and a lack of sea breeze can’t chase the ‘chilli’ scents away. 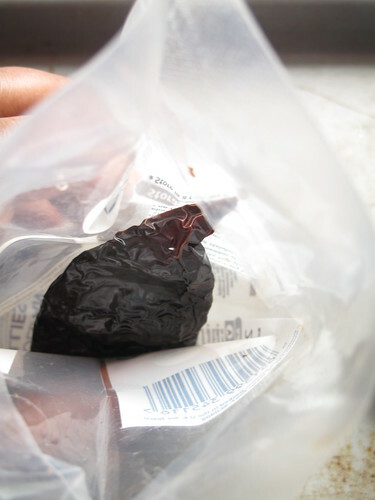 If your ancho came in a bag like mine, grab your scissors and punch a hole in the pack and wait, it will hit you hard. 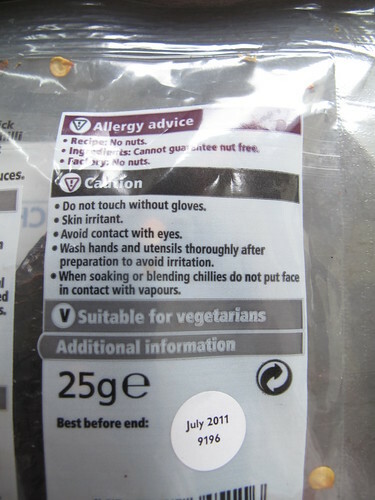 Chilli. 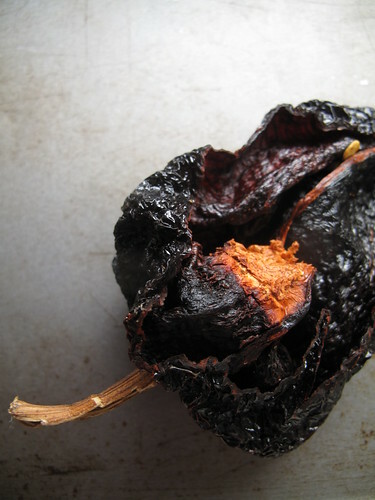 Chilli. Chilli. 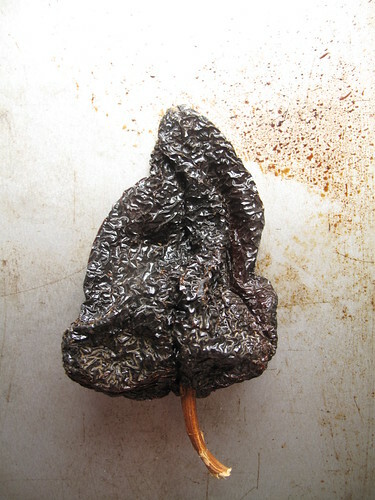 Wrinkled with its own peculiar gloss, almost leathery, this chilli pepper would make a great designer bag, only if we are thinking new age though. Bag, definitely not shoes. My attempts to chop it up into nice bits with a sharp knife were painful and torturous so out came my scissors again and snip, snip, snip I went. When I was done, I threw all the ingredients into a pot and as the blue flames danced underneath my silver pan, I watched the mixture come alive. First a gorgeous red but then minutes later, the life sucked out of the strawberries and they took on a pink, rather ungainly look, but not for long. 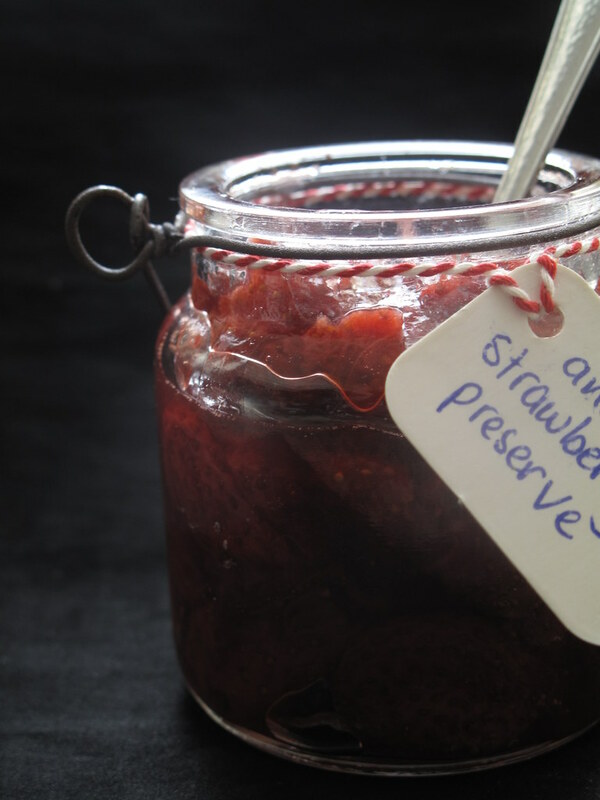 In the interim, the air in our living room was enveloped with the light summeriness of stewed strawberries, something I was all too happy to experience as compensation for the loss of beautiful colour. 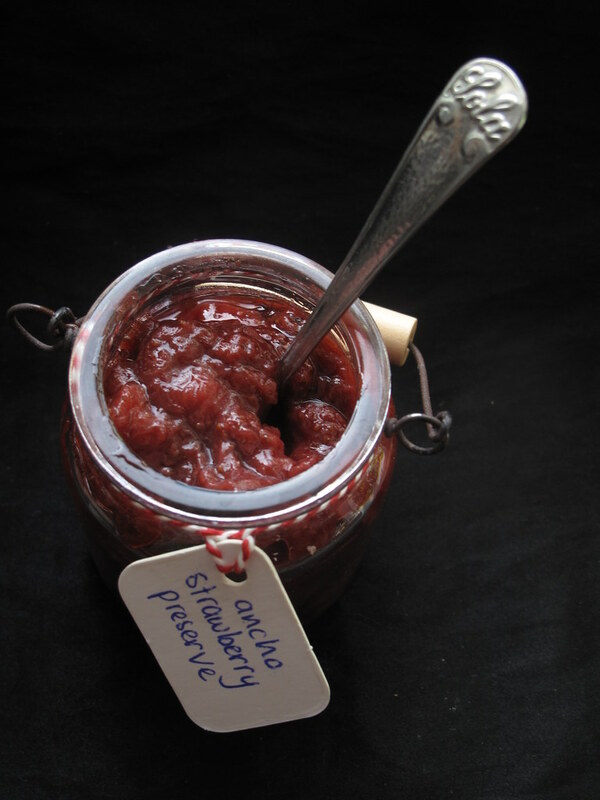 In the end, gentle stirring, slow cooking and the preserve settled on a gorgeous, translucent deep red. By this time it was late and so I went to bed, preserve in pot. 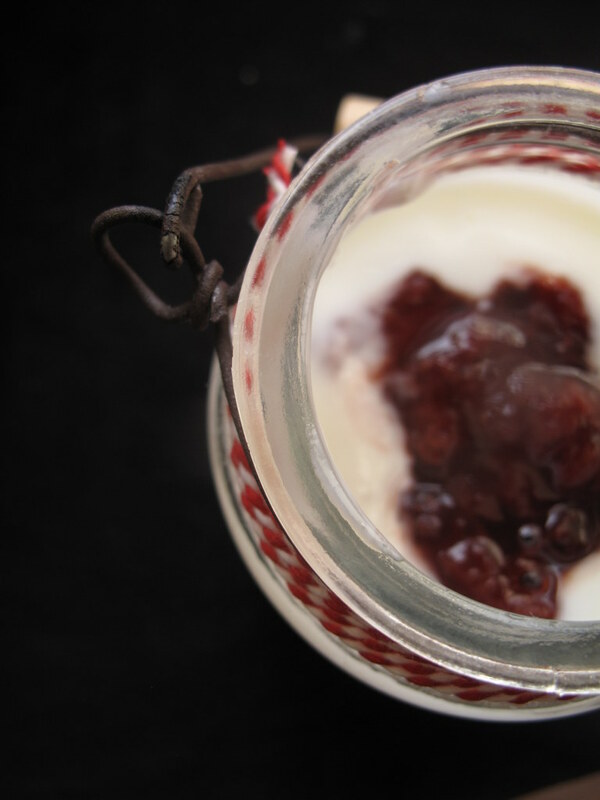 Next morning, I set it in a clean little pot and popped in the fridge, knowing it would face my peach jam fate in not lasting long. 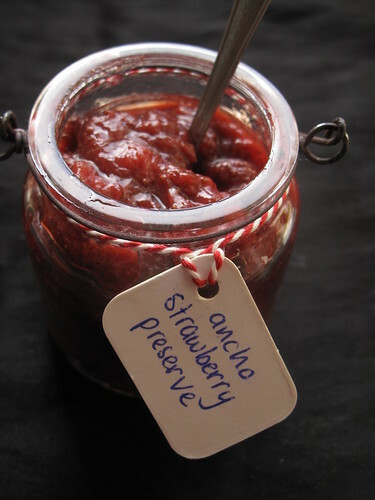 Ancho Strawberry Preserve, adapted from Amanda Hesser’s Preserved Strawberries with Chiles. Place the strawberries in a heavy, medium-size pot and using a potato masher, gently press down, to release some juice and to bruise the fruit. 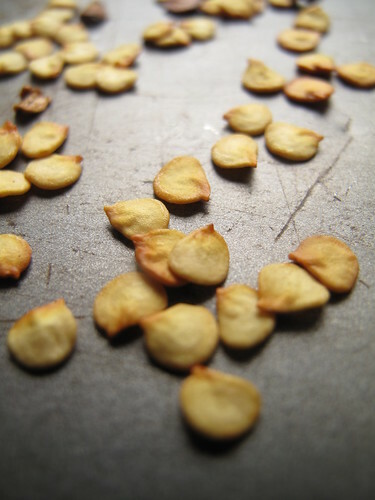 Remove the stems and seeds from the chile (no soaking is required) and discard. 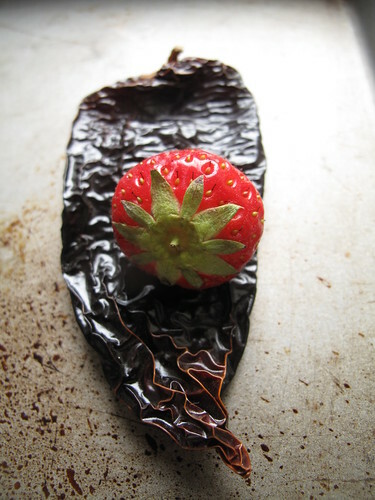 Using a pair of (kitchen) scissors, roughly chop the remaining dried chilli flesh and add it to the strawberries. Pour in the maple syrup, vanilla extract and lime juice. 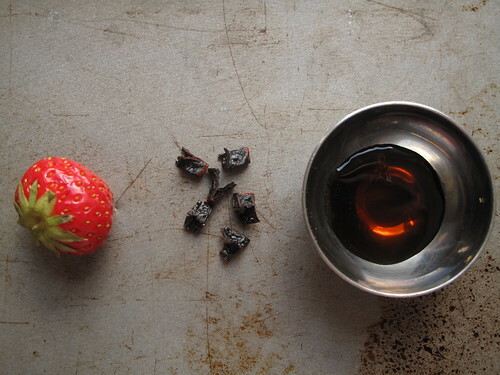 Set the pot over medium heat and bring to a boil: as the fruit begins to juice, the sugar will melt the mixture will become rather liquid but don’t worry, it will reduce down nicely. Reduce the heat to a steady simmer and cook for about 1 hour, gently stirring it every 10 minutes so the strawberries stay intact and candy. 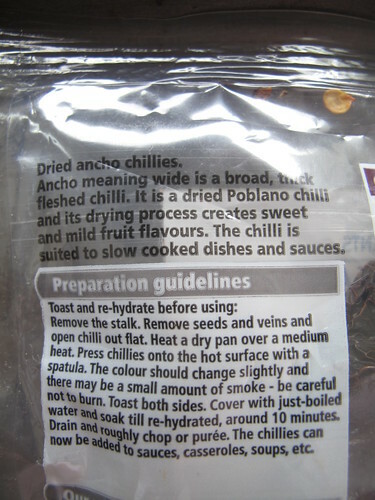 Taste and adjust the chilli so you get the right heat/flavour level. 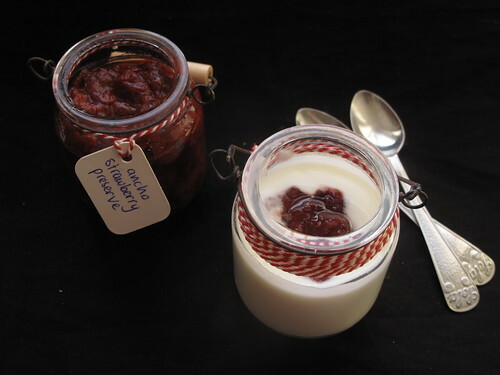 As the preserves cook, use a spoon to skim any scum which rises to the surface. 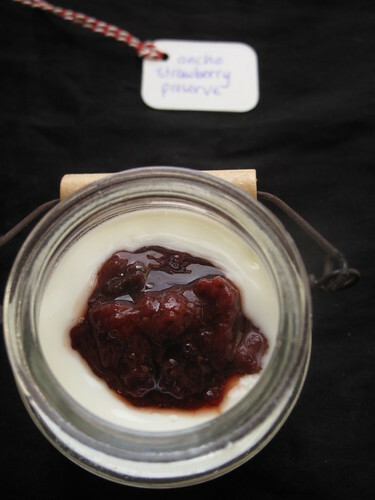 The preserve is ready when the strawberries are shrunken and lightly candied, and the syrup has thickened but is not so thick that it’s like jelly. 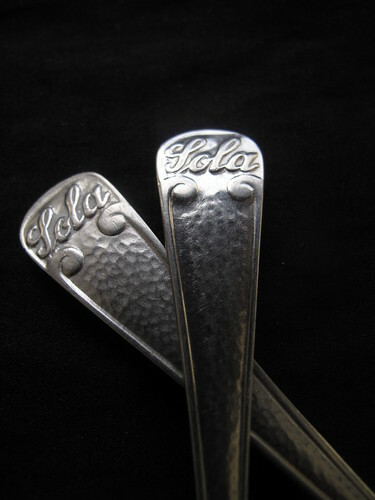 (The best way to test it is to pour a little bit onto a plate and let it cool before checking the consistency). 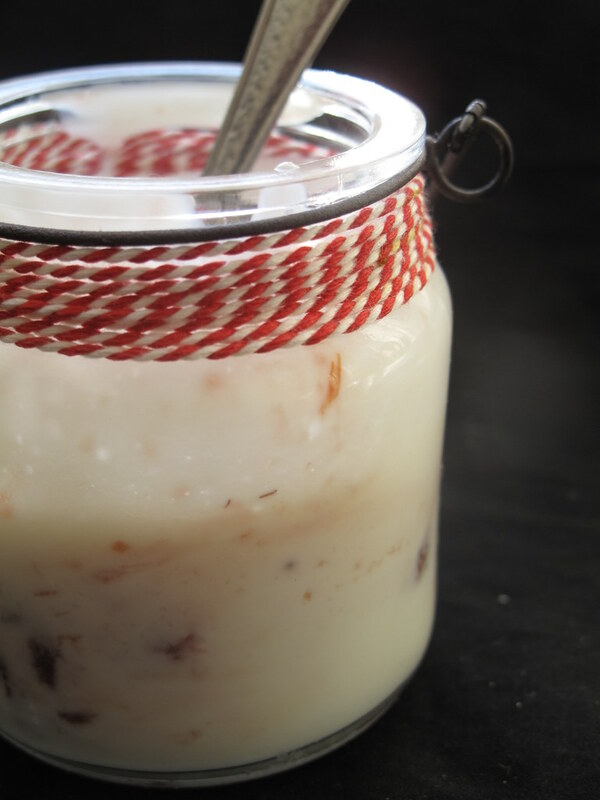 Serve on yogurt or ice cream, with breads and cakes, and like we had – on French toast. Enjoy your week and thanks for stopping by. 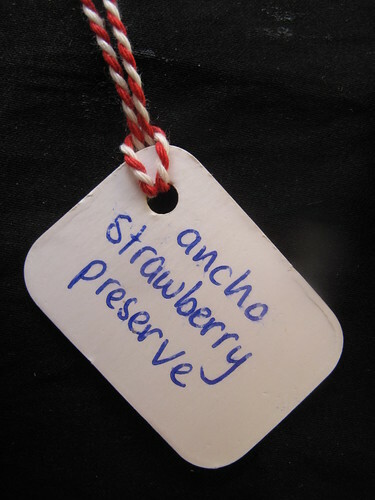 What’s your favourite thing to do with strawberries (in the summer)? Lots of love.